For recording details of accidents in the workplace All accidents should be recorded by law so this can be used in court if employee were to take legal action against the company. The Actfast Anti Choking Trainer vest teaches students to perform the technique correctly without the risk of injury to another student thus leaving the class fully confident in performing abdominal thrusts. The Ambu® Mini Perfit ACE extrication collar is designed to assist with the maintenance of neutral alignment, prevention of lateral sway and anterior-posterior flexion and extension of the cervical spine during transport and routine patient care or movement. Facilitating quick and easy application, our versatile dressing comprises of a long conforming bandage to securely hold the dressing in place, with a highly absorbent wound pad - thicker than most standard dressing bandages. Thicker wound pad than the standard (Steropax) dressings. BD Venflon IV Cannula BD Venflon? intravenous catheter with integrated injection port and valve for peripheral catheterisation. Steroplast Blister cushion offers superior relief and comfort for any blister. Having a medical grade adhesive makes it perfect for sensitive skin. Permeable hydrocolloid patches for the prevention and protection of blisters. BS-8599-1 Compliant Catering First Aid Kit Specially designed for use in the food industry, a catering first aid kit comprises of carefully-selected components to help treat common accidents and injuries that occur during food preparation, namely burns, cuts and slices. Every workplace needs medical provisions, and our excellent range of compliant first aid kits include all the essential components to deal with common work-related injuries, including cuts, burns, strains and sprains. Our standard compliant first aid kits includes all the essential components to help you respond effectively if an employee suffers an accident or becomes ill at work. For a more comprehensive set of medical supplies, our premier compliant kit involves an extensive selection of equipment to treat a wide range of workplace injuries, including resuscitation face shields, foil blankets and burn dressings. The NEW BSI workplace first aid kit is fit for purpose, meets customer demand and is appropriate for the modern workplace. Burnshield Burn Gel Dressing 20cm x 20cm This dressing has been sized for the treatment of burns and scalds with a surface area of less than 20cm x 20cm To help minimise the potentially devastating effects of burns and scalds, an immediate and effective treatment is essential. A unique versatile foam dressing provides essential immediate treatment and protection within the first critical 24 hours, following a burn. The dressing is saturated with a sterile, water-based gel which is non-toxic, non-irritant and does not contain any fats or greases. It moisturises the burn area, and soothing tea-tree oils cools the skin there by minimising trauma or tissue damage. It is non-adhesive and can be removed with cool water or saline solution without causing discomfort. For use on 1st, 2nd or 3rd degree burns – including facial burns and scalds. Apply directly to the wound and cover with a protective bandage. Our burn care range includes a variety of kits suitable for the emergency services and high-risk workplaces, such as hotels, restaurants, canteens and kitchens. We also supply more compact but equally comprehensive kits for use in the home and on holiday. We supply an assortment of Burnshield consumables, including contour dressings, ideal for treating large burn areas, as well as hydrogel and burn blotts, which alleviate pain and prevent damage to healthy tissue. Immediate effective treatment - soothing, cooling relief for burns, scalds and sunburns. 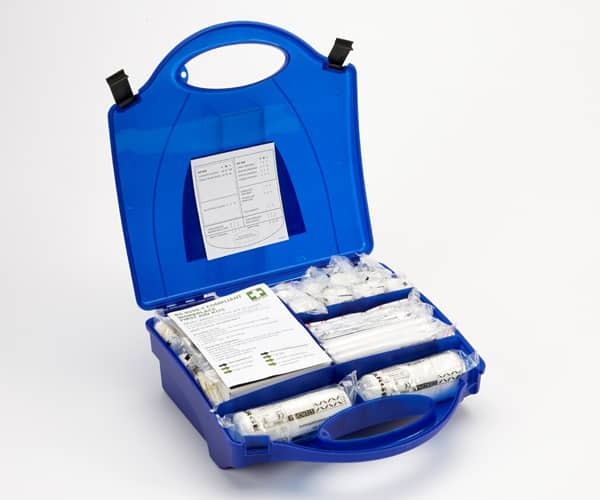 This high quality burns first aid kit has everything you need to deal with burns in the home and workplace. The sooner burns and scalds are treated, the better the outcome. To treat to skin damaged by flame, steam, hot water, sun or other intense heat, it is important to have the appropriate first aid supplies on hand and to use them as soon as possible after an incident occurs. Benefits to the user Clinell Bucket of Universal Hand & Surface Wipes - Bucket 225 • Can be used on dirty hands (ie soiled hands). • Skin safe, no sore or dry hands with frequent use. • Ideal for use on stethoscopes, blood pressure cuffs and pulse oximeter probes. • Universal wipes act as a disinfectant, detergent and hand wipe replacing the need for different types of wipes and surface cleaners. Tested to - European Standard EN1276 and prEN 12054. The Clinell product range combines innovative technology with ease of use. Providing the professional healthcare industry with the most effective infection control solutions available. Benefits to the user: • Can be used on dirty hands (ie soiled hands). • Skin safe, no sore or dry hands with frequent use. • Ideal for use on stethoscopes, blood pressure cuffs and pulse oximeter probes. • Universal wipes act as a disinfectant, detergent and hand wipe replacing the need for different types of wipes and surface cleaners. Tested to - European Standard EN1276 and prEN 12054. Will not stick to skin or hair.